Granola is one of my favourite things to eat for breakfast. When done well, it is filling, super tasty, and full of goodness. The things is, a lot of store-bought options are full of refined sugar, which isn’t good for my PCOS and blood sugar levels. So a natural option is much more preferable. And with enough notice, making your own is super simple. Doubling up quantities can be a good idea too, then just store it in a large Kilner jar. I bought a load from John Lewis for this very reason and it definitely encourages me to fill them up! You can still get some sweetness with maple syrup, but there isn’t need for the extra. The cinnamon gives it a nice flavour too, though you could omit (or substitute for something like cardamon), if you don’t like the taste of cinnamon. The main basis of this crunchy granola is buckwheat; a nutritious gluten-free grain. I honestly love how versatile it is. It can be used raw, in things like this to give it a good crunch, as well soaked and blended to make a porridge. Buckwheat is an amazing source of protein, and is rich in fibre and B vitamins. Goodness all around! I like to have my granola with almond milk or coconut yogurt (my favourite is Coyo), and add some fresh berries or compote on top. But the great thing is it can pretty much go with anything, and can even work in a small pot for an on-the-go-snack. Heat your oven to 160°C, and line a large baking tray with baking paper (if needed). Then mix together the buckwheat, quinoa, almonds, pumpkin seeds, sunflower seeds, chia seeds, sesame seeds, cinnamon, and salt in a bowl. In a separate bowl, mix the melted coconut oil and maple syrup together. Then add the vanilla and mix it all until smooth. Pour the syrup mixture over the seed mix and stir it all well together until well combined. Try to make sure there are no parts that are left dry. Spoon the mixture out over the baking tray and press down with the back of the a spoon. Pop in the oven and bake for around 30 minutes, until it is looking golden and firm. If you don’t have a fan oven, then you may need to rotate the baking tray half-way through cooking to make sure that it all browns evenly. Take from the oven and leave to cool in full before moving off the tray. Once cooled, break up and store in a clean glass jar, or eat straightaway. What are your favourite breakfast foods? Would love to hear what you think! My boyfriend loves granola, I just don’t see it as my thing. You have persuaded me to try it though! Oh this looks delicious and so healthy too! I need to have something better for breakfast each day that just toast! 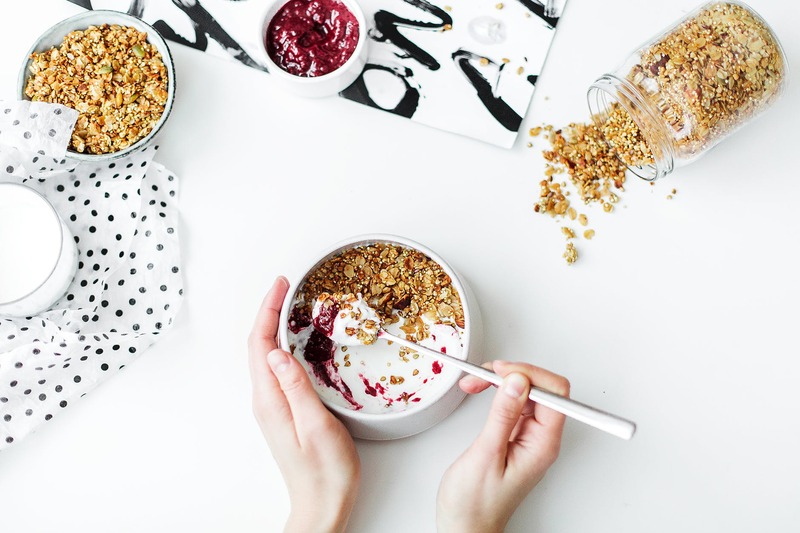 I love granola and this looks delicious! Your photos make it look even tastier! Oo this looks so delicious! I love granola but agree that shop bought ones are so full of sugar. Now I know how easy it is to make my own I’ll have to try it myself. 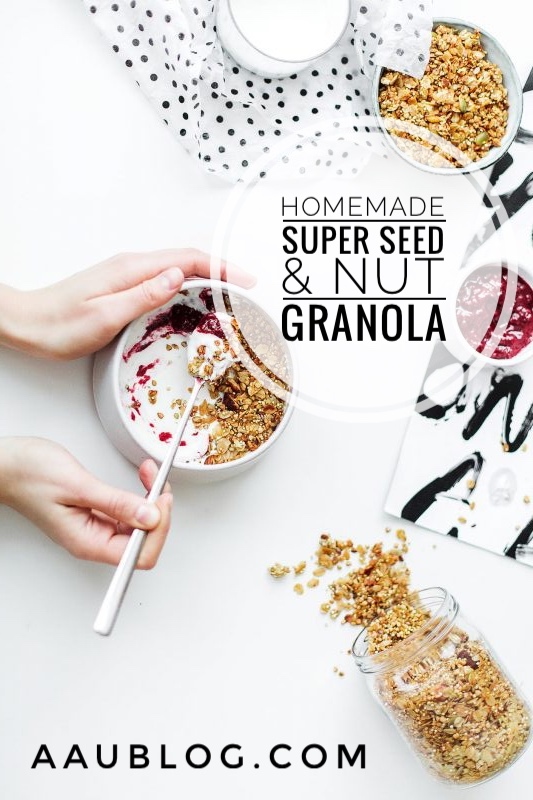 I do love granola and this would be something that I would love to make at home. looks more healthier than the stuff you buy at the store too.